Origin and Habitat: Grows in an area that stretches from from the Chihuahuan Desert to the South Texas Plains, on either side of the middle and lower Rio Grande River, southward to the Mexican states of Chihuahua, Coahuila, Durango, Nuevo León, San Luis Potosí, Tamaulipas, Zacatecas. 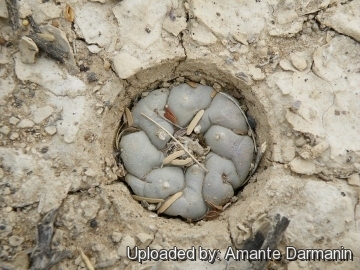 Extensive stands of peyote occur on the low, rocky hills in Starr, Zapata, Webb, and Jim Hogg counties of southern Texas. Altitude: It grows from 100 up to 1900 metres above sea level. 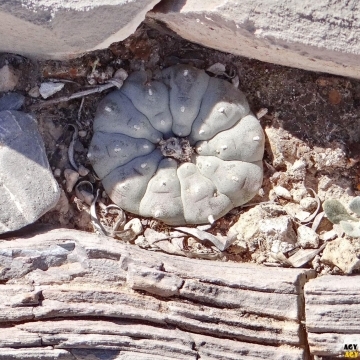 Habitat and Ecology: This geophytic, button-like cactus occurs in xerophyllous scrub including Tamaulipan thorn scrub isolated or in groups usually in calcareous deserts, on rocky slopes, or in dried river beds. 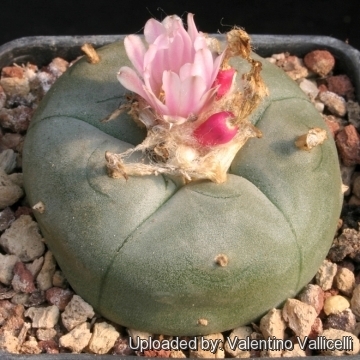 The species is very abundant in habitat with large number of mature individuals however many subpopulations of Lophophora williamsii are heavily harvested in the wild throughout the range of the species, some to the point of extirpation. In Mexico, collection is illegal and people are punished for collecting it. Land use change for agriculture is a significant threat, as the land is completely ploughed, thus eliminating all vegetation including L. williamsii and its seed bank. 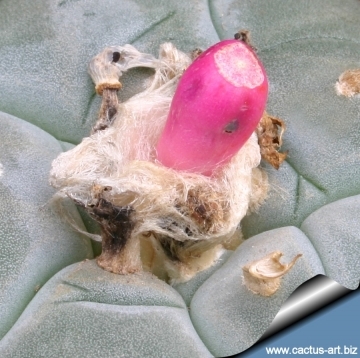 Stem: Glaucous green, dull bluish or greyish green, very succulent, globular, top-shaped, or somewhat flattened up to 6 cm tall, 12 cm diameter, with a woolly top; The subterranean portion of the stem, which is as wide as the aerial portion, extends several cm below the surface of the ground and transitions smoothly (through a thin hypocotyl) into a large taproot which may extend over 25 cm below ground level. Flowers: Solitary, campanulate, 1.5-2.5 cm across when open usually pink (rarely whitish) outer perianth segments and scales ventrally greenish. They emerge from the mass of hairs at umbilicate centre of crown each surrounded by a mass of long hairs. Stigma-lobes 5-7, linear, pink. Seeds: Small and black up to1 mm in diameter, with broad basal hilum, tuberculate-roughened. Because of the tap root they are very rot prone, so use highly gritty compost with much drainage. Requires half shade to part sun. 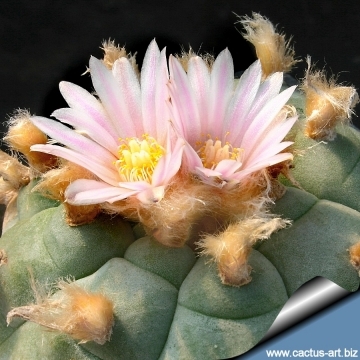 Waterings should be rather infrequent to keep the plant compact and not to become excessively elongated and unnatural in appearance, watering it properly is often difficult because this plant tends to crack open or rot if over-watered. The fact that the plant retracts into the soil and assume a grey-green colouring between watering, is perfectly natural and doesn’t cause any damage. Propagation: Easy to propagate from seeds. The seeds are, requiring hot and humid conditions to germinate. 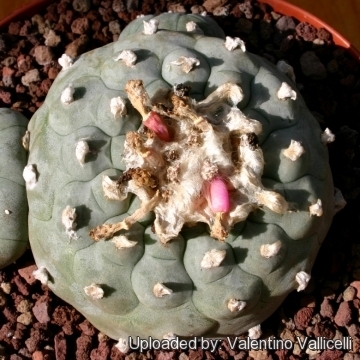 Uses: Peyote has been used for centuries for the mystical effects experienced when it is ingested. 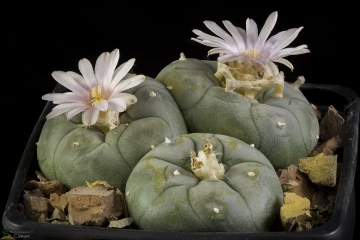 It contains a large spectrum of phenethylamine alkaloids, the principal of which is mescaline. 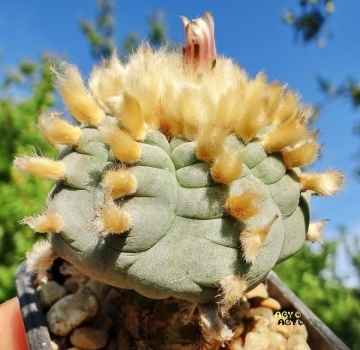 The top of the cactus that grows above ground, also referred to as the crown, consists of disc-shaped buttons that are cut from the roots and dried. These buttons are generally chewed, or boiled in water to produce a psychoactive tea. The resulting infusion is extremely bitter and, in most cases, the user experiences a high degree of nausea before the onset of the psychedelic effects. 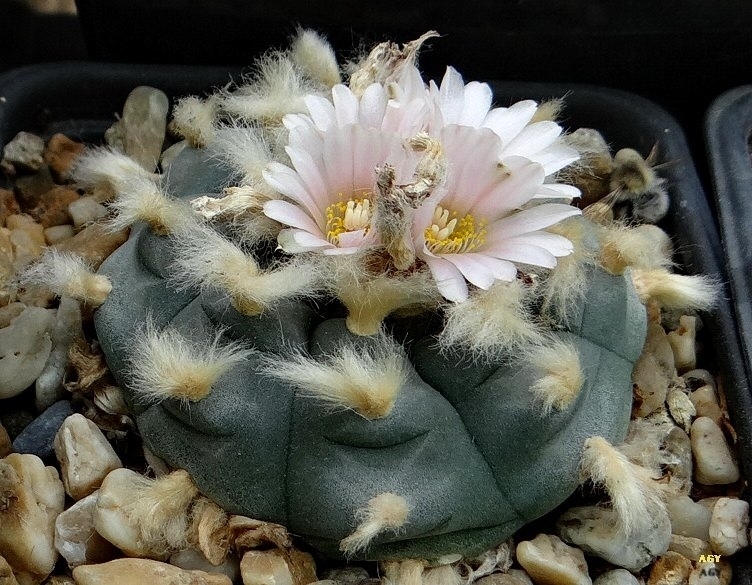 However cultivated plants have only traces of the alkaloid present in wild harvested plant and their “psychedelic” effect are minimal or completely absent, but they still cause nausea, vomit, headache.